Kingdom Hearts coded is the fourth game in the Kingdom Hearts series, taking place just before the epilogue of Kingdom Hearts II and possessing a deep connection with Kingdom Hearts Birth by Sleep. It is an episodic puzzle video game which was released from 2008 to 2010 in eight episodes on the Docomo Prime Series-P-01A Panasonic mobile phone. It was previously available on its official website, but as of April 20, 2013, the app is no longer available for download and the website is no longer accessible. The title was only available in Japan. However, a remake, released in Japan, North America and Europe, was developed for the Nintendo DS, under the title of Kingdom Hearts Re:coded. Data-Sora fighting Shadows in Traverse Town. The game takes place preceding the finale of Kingdom Hearts II and follows the story of Jiminy Cricket, King Mickey, Donald Duck and Goofy in Disney Castle. While organizing the records in Jiminy's journal from his travels with Sora and his friends, Jiminy Cricket's curiosity about the line "Thank Naminé" results in him finding a message that he did not write: "We must return to free them from their torment." To investigate this message, King Mickey digitizes the contents of the journal and goes into the simulated world to investigate; awakening a virtual Data-Sora on the virtual Destiny Islands to carry out the contents of the journal to uncover the identity of "them". 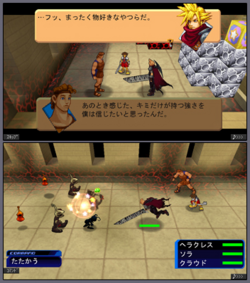 As Data-Sora awakens on Destiny Islands, he encounters numerous "bugs", which take the form of red and black blocks, covering the whole world. Upon eliminating the Heartless and destroying the bugs, Sora traverses to other worlds infected with bugs to return them to normal, following the cloaked figure upon orders from King Mickey. Meanwhile, Heartless begin appearing within Disney Castle, and everyone finds themselves trapped in the room. To their surprise, they are saved by Data-Sora. Suddenly, the cloaked figure reveals himself to be Jiminy's Journal taking the form of Riku, and explains that they are no longer in the real world, but the data world. Sora is sent off by the Journal to discover his true identity, only to encounter Maleficent and Pete from the real world. Maleficent destroys Data-Sora's Keyblade and summons Heartless to attack him. Mickey and the Journal arrive to save Sora, but the Journal is abducted by Maleficent, with Mickey giving chase. Sora makes his way through Hollow Bastion, aided by Donald and Goofy. They encounter Pete, who summons the Journal and takes control of him with the bugs to fight them, but Sora still manages to defeat the Journal, who falls unconscious. Mickey arrives and informs Sora that unless the bugs are destroyed, the Journal will never awaken. Sora decides to find a way to awaken the Journal, and enters Riku's data world, losing his abilities in the process. The two visit various worlds from the Data-Riku's memory and find their way back to Hollow Bastion, where they fight and defeat Maleficent. Meanwhile, King Mickey discovers that he will be returning soon to the real world, but the Journal, once completed, will have to be erased, which will mean the end of Data-Sora's memories. When the time comes, Sora requests more time in order to save Pete and Maleficent, who are still in the data world. Sora finds them fighting Sora's Heartless, but Pete and Maleficent are seemingly erased before he can intervene. Sora defeats Sora's Heartless, and finds that Pete and Maleficent were rescued by the Journal through a "rift in the data". They leave the Data world shortly before Mickey returns to the real world, erasing the Journal. A new message appears claiming that a new door to a new world has been opened, which is the data of the data world added into the Journal. Mickey, realizing that this quest may be too dangerous for Data-Sora as he has no memory of it, requests to be taken into the Data World once again. Finding Data-Sora in Traverse Town, Mickey takes him to Castle Oblivion where Data-Sora is confronted by a young man wearing a black coat. He tells Sora that if he wants to know the truth, he must move forward on his own through the previous worlds he visited destroying bugs. During this time, he realizes that even if he doesn't remember someone he's met, there's still the sadness of having forgotten them which the figure attempts to warn not to let it consume him. Sora disregards this message and fights the figure, revealed to be Roxas. After losing to Sora, Roxas gives him a card as Mickey appears. Sora opens the next door to find Naminé, who reveals the bugs to have been an unintentional side effect of her attempt to restore Sora's memories. She then reveals Sora's nature as the "Key that connects everything" through his ties with herself, Roxas, and Xion. Furthermore, Naminé tells Data-Sora about three figures (Terra, Ventus, and Aqua) also tied to Sora's heart who are the ones referred to in the message and need his help. Mickey bids farewell to the Data-Sora and promises Naminé that he will inform the real Sora of this. In the final scene, Mickey sends Sora a bottled letter (the same one sent by Mickey at the end of Kingdom Hearts II), which Sora reads with Riku and Kairi. Data-Sora fighting with Cloud and Hercules. Gameplay uses red and black Bug Blox floating in mid-air. These blocks are used to solve puzzles and reach higher ground. A debugging mode is also featured. In this mode, you remove the blocks, to progress to enemies. There are also times when you just fight opponents like in Olympus Coliseum. There are times when Sora fights alongside other characters like Hercules and Cloud in the Olympus Coliseum episode. After the events of an episode are over, the player can buy new items for Kingdom Hearts Mobile. ↑ SQUARE ENIX BRINGS AN UNRIVALED LINEUP OF FRANCHISES TO E3 2010: "For handheld platforms are The 3rd Birthday™ and KINGDOM HEARTS Birth by Sleep for the PSP® (PlayStation®Portable) system, a prequel that will unlock the secrets to the beloved franchise, as well as KINGDOM HEARTS Re:coded and FINAL FANTASY: THE 4 HEROES OF LIGHT™ for Nintendo DS™, a charming new adventure by the creators of the FINAL FANTASY III and IV remakes."